Proudly standing side by side Ferring Beach Houses are life on another scale. 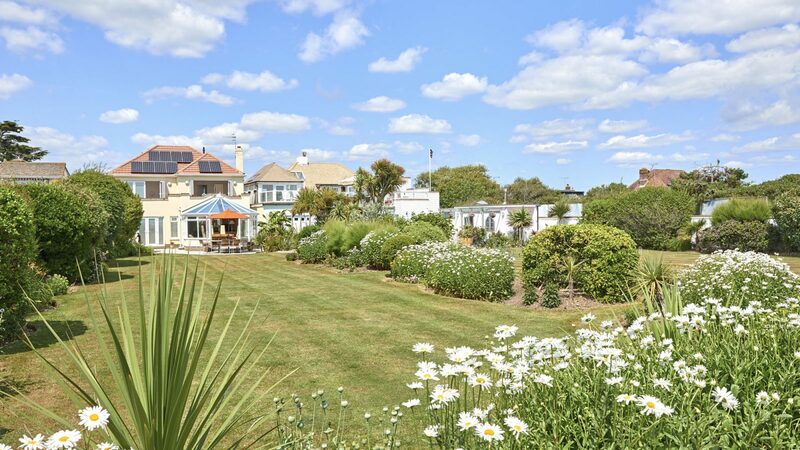 The croquet lawn sprawls immaculately away towards the shingle beach. The heated outdoor pool gleams aquamarine in the sunshine. The sundeck balconies await. Dine outside in the south-coast sunshine beneath the palms, embrace the space, lap up the luxury. Stunning is an overused word. 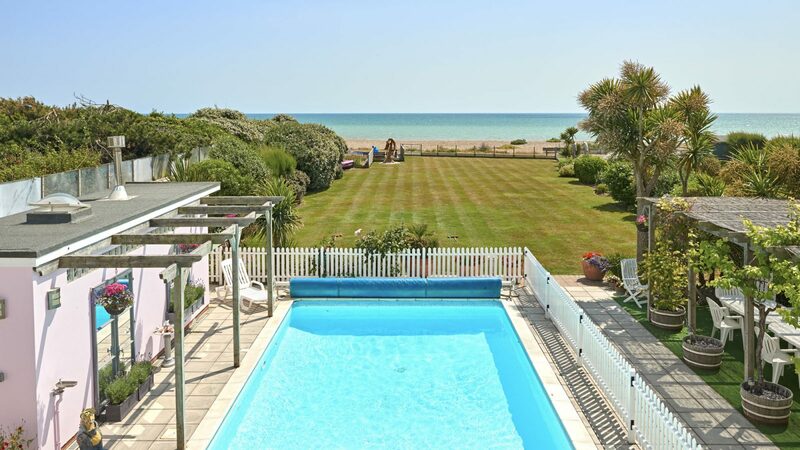 But it applies at the Ferring Beach Houses near Worthing, with the quiet Ferring beach at the end of the gorgeous garden, the sprawling sun-deck balconies, the quiet hideaway rooms, the giant oak sculptures. Oh, and the small matter of the outdoor heated swimming pool. This is life on another scale. 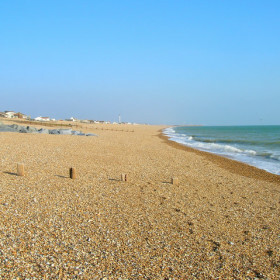 Get the family together, head for the Worthing seafront and turn right to South Ferring, with its colourful beach huts lined regimentally along the shingle seafront. 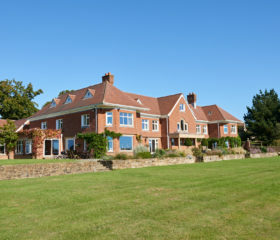 There’s space for 20 here between two luxury houses. 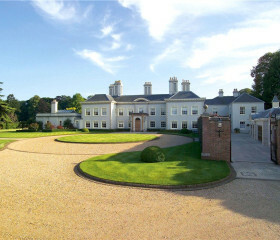 Spread out in clean-lined, oak-floored comfort, laze around the pool and run the croquet hoops on the immaculate lawn. The inside story is just as spectacular, but all roads lead outdoors here. Fling open the French windows and dine on the patio or by the palm-fringed pool. 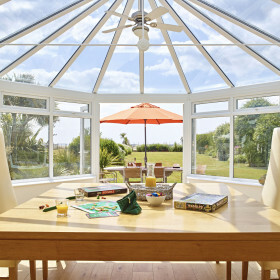 If the sun isn’t in full working order, the orangeries are. After breaking the bread and glugging the wine, you’ll loosen your belts and hang out on squishy sofas in the open-plan lounge. Entertainment abounds: with the pool table, table football, DVDs, wifi, even a landlocked boat in the garden for imaginary childhood adventures. 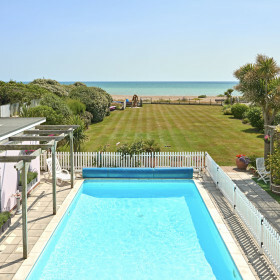 Beyond the croquet lawn, the garden wall and the picket gate sit the pebbled beach and the sea and all its endless possibilities. 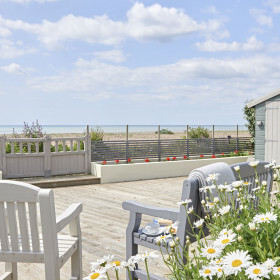 It’s an inside-out life here at the Ferring Beach Houses. The lure of the pool and gardens is impossible to resist. 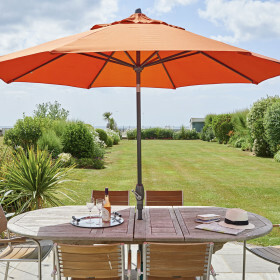 The palms sway in the ocean breeze, the rolled towels sit ready on the sunbeds, the croquet lawn stretches south towards the shingle beach, the parasols offer shade for your garden-cooked steak and salad. You can see the whole vista from the expansive balcony sun decks. 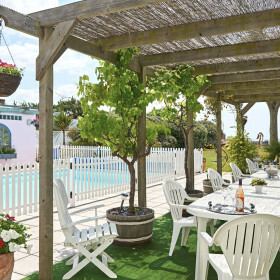 In one of the gardens, the heated pool sits below you, framed by the white picket fence. On the left, trellis is fixed exotically to the pool house. To the right, the outdoor dining furniture shelters beneath the pergola. 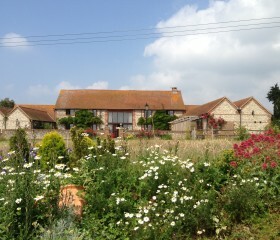 On a summer’s day, it’s a Mediterranean scene in Costa del Sussex. Beyond the pool, in the second garden, you’ll see the striped lawn sweeping away past the palms and bushes towards the landlocked play boat and the mermaid statue. 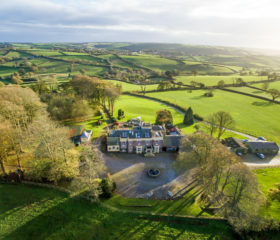 There’s croquet to be played here on the immaculate lawn, or cricket on the beach beyond the stone wall and the pretty picket gate. This is where England meets the exotic. Barring a hurricane, you’ll want to be outdoors among the palms, on the immaculate lawn, around the glinting pool and down on the pebbly beach. But inside’s larger than life, too. 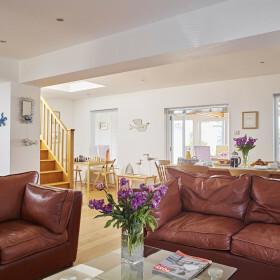 Two large open-plan living rooms present you with squishy leather sofas, big TVs, DVDs, and coffee tables for drinks and biscuits. These are nice places to hang out, discuss the day or share a movie among the oak flooring, spotlighting and the modern décor. 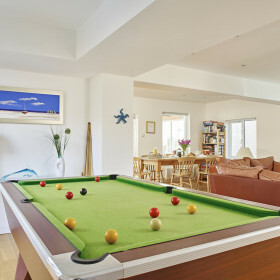 Off to one side, the pool table can make hours disappear. 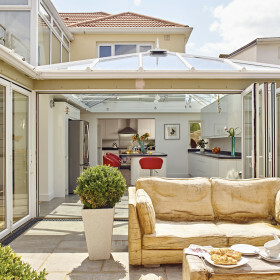 For that garden feel inside, you’ll want the orangeries. 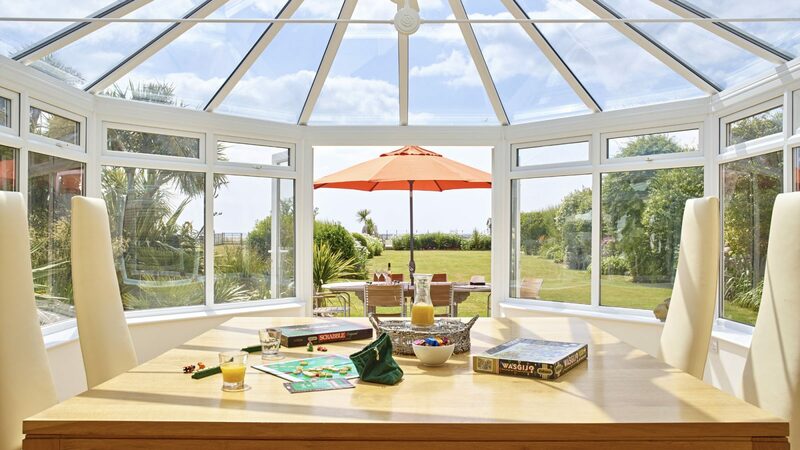 Bright, light and ready for booky escapes or board games, they come with sweeping views of the lawn and shrubs. The balcony sun decks come equipped with sunloungers. 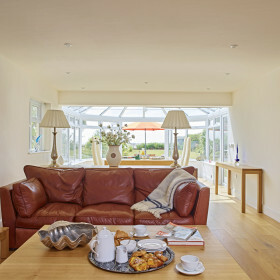 Begin the day here in your dressing gowns with croissants and coffee. 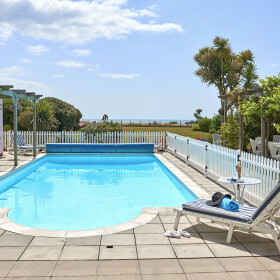 Then laze all day in your shades if you wish, with the sun glinting off the swimming pool and the lawns panning out towards the beach and the crashing waves beyond. There are worse places to be. 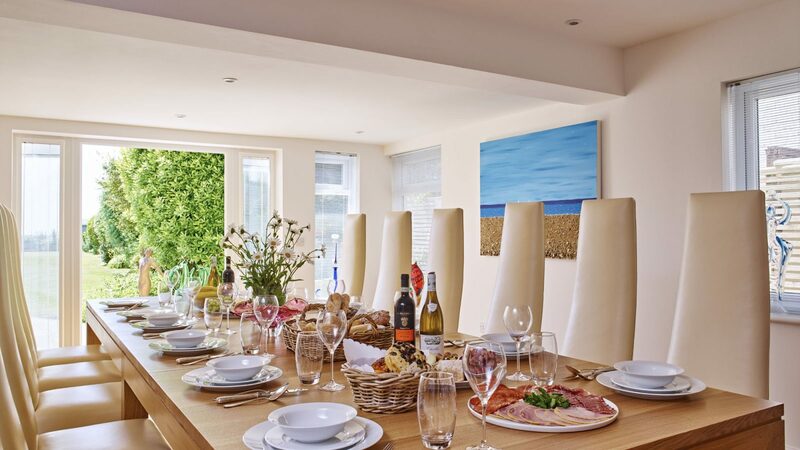 Getting together over good food is a summer breeze at Ferring Beach Houses. 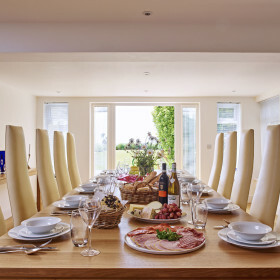 Pick up your fresh fish from the seashore and collect your English wines from Southdown, then gather around the big oak tables, seating 14, 12 and eight, for food prepared in the state-of-the-art kitchens on fan-assisted ovens and gas hobs. 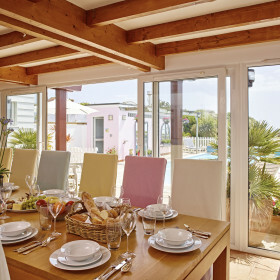 If the sun is smiling on you, head outside to the tables for al-fresco dining under the pergola by the pool or beneath the parasols on the sun decks. The gas barbecue awaits the sizzle of seared scallops and the wine’s chilling nicely. Feeling lazy? Call up our chefs for a one-off celebration or fully catered holiday. Needing supplies? 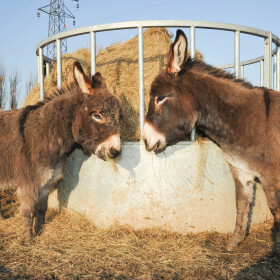 COOK at Rustington Village is a good foodie cheat store, selling hearty homemade meals – frozen. 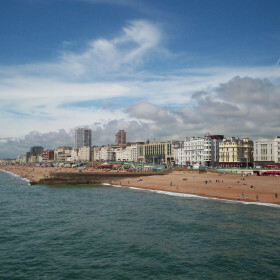 For eating within the sound of the sea, try the Bluebird Café. Just 100 yards from the house and with its toes in the sand, the Bluebird brings you local ingredients with a salty tang in the air. The Tudor Close in Ferring is a good gastropub, and you can complete the Mediterranean feel with tapas at the Andalucia washed down with a pitcher of sangria. For Michelin-starred magic, take the A24 to Horsham’s The Pass or Restaurant Tristan. There are nine bedrooms here, five in The Pink House and four in Yellow Sands. But numbers do no justice to the beauty of the experience. 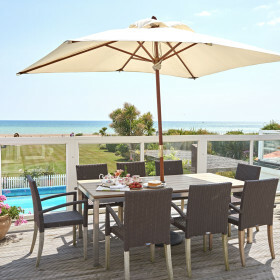 On a summer’s day, peel back the bifold doors and pad out to the sun deck for breakfast. Delicious – and not just the croissants, coffee and orange juice. At night, let in the salty air and the sound of the sea with an open window. Choose from four double bedrooms. 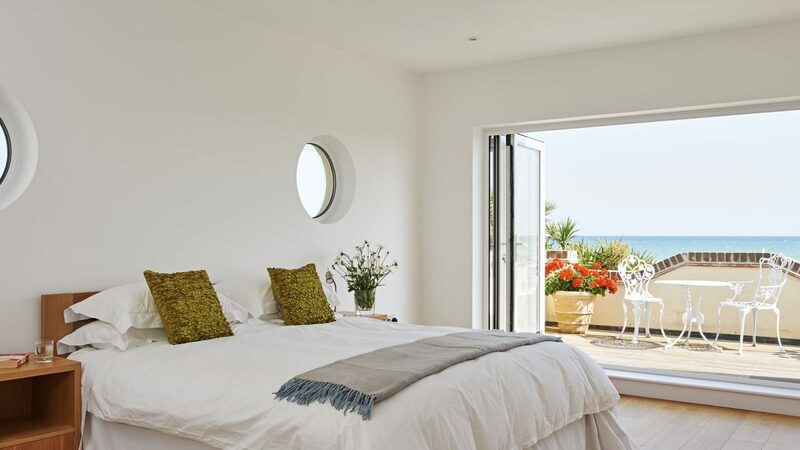 The Pink House has one king size bedroom with an en-suite and Yellow Sands has one super king size with a bathroom en-suite and two king size bedrooms, one of which with access to it’s own veranda. 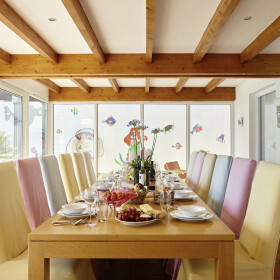 The Pink House has two twin bedrooms while Yellow Sands comes with one. There are beds under each of the two singles – making comfortable rooms (two en-suite) for families of four. 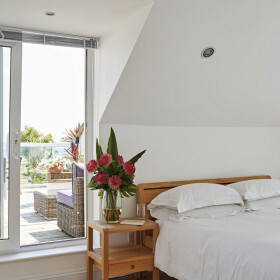 You’ll find a bed under the single bed in one of the single rooms in The Pink House that can make it a twin or double bedroom that sleeps two in comfort, with shower en-suite. Finally, a single room with a single bed with a bed underneath that shares a bathroom. 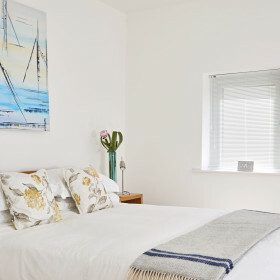 Let stress fall away in the bedrooms’ simple, clean, minimalist beauty, with oak floors and furniture, ceiling spotlights, and white walls and linen. Relax, sleep well. You’ve earned it.